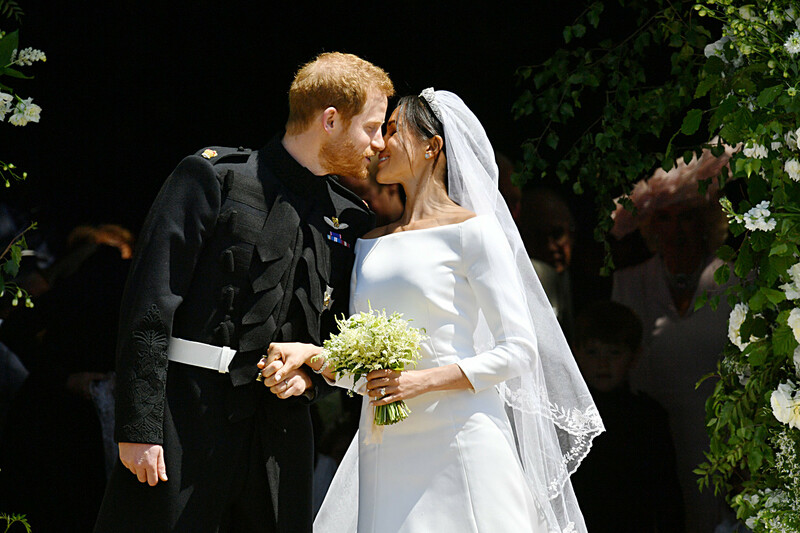 Walking down the aisle with his bride, Prince Henry, Duke of Sussex, was wearing a rather posh-looking uniform, which resembles what Nicholas II of Russia in early 20th century photos often wore. Was it a conscious move or just coincidence? First of all, Nicholas II and Prince Harry are relatives: Harry is the great-grandson of George V (1865-1936), King of the United Kingdom (1910-1936), who was Nicholas II’s cousin. The uniform that today looks like a Yamamoto design is really over a hundred years old. It’s the uniform of the colonel-in-chief of the Royal Scots Dragoon Guards, the oldest surviving Cavalry Regiment of the Line in the British Army. The current colonel-in-chief of the regiment is Queen Elizabeth II (since her accession to the throne in 1952). Tsar Nicholas II was appointed the first colonel-in-chief of the 2nd Dragoons (the Royal Scots Greys) in 1894. This appointment occurred during the wedding celebrations of the Tsar to Alexandra Feodorovna, a granddaughter of Queen Victoria. 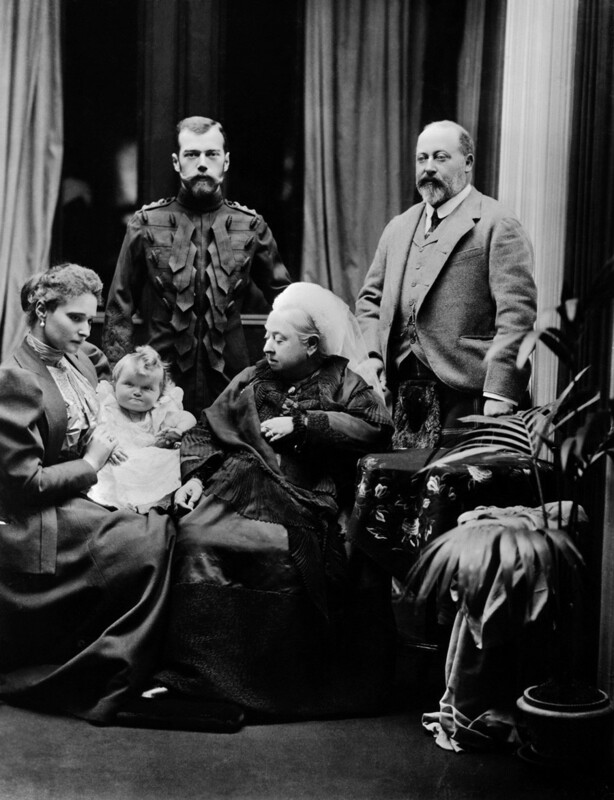 (from left to right): Alexandra Feodorovna, Czarina of Russia; the infant Grand Duchess Olga; Nicholas II Alexandrovich Romanov, Tsar of Russia; Queen Victoria of England; and Albert Edward, Prince of Wales. Tsar Nicholas was very impressed by the Royal Scots Greys and wore his full uniform as colonel-in-chief at various events, including his visit with the Tsarina to Balmoral in 1896 (pictured). The strange-looking horizontal slaps on the uniform jacket are really a cavalry uniform detail, inherited from Hungarian national costumes, which historically became a European cavalry uniform. Why did the Russian Tsar wear an English Guard uniform? 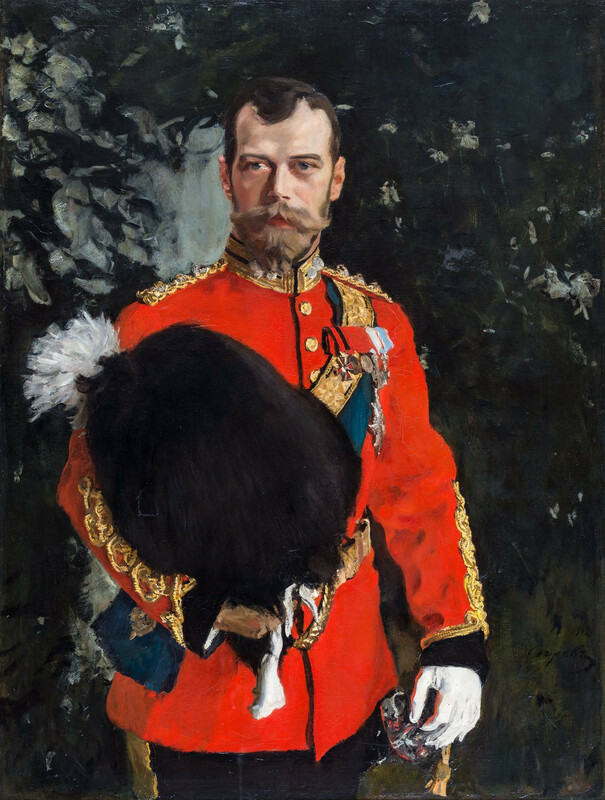 Nicholas II, colonel-in-chief of the Royal Scots Greys', 1902. The Emperor in full dress uniform as Colonel-in-Chief of the 2nd Dragoons (Royal Scots Greys). Artist Valentin Serov. Paying respect to the military corps by wearing its uniform is an old military tradition. In the Russian army, it was called “courtesying with uniform.” For example, the Russian Grand Dukes, who throughout their lives often held the position of colonel-in-chief of various regiments, kept their uniforms to wear them at honorary events. In the same fashion, Nicholas II, George V’s cousin, was appointed an honorary colonel-in-chief of the Royal Scots Dragoon Guards, and remained so until he and his family were murdered by the Bolsheviks in 1918. European monarchs were also colonels-in-chief of Russian Imperial army regiments: Franz Joseph I of Austria was colonel-in-chief of Kexholm Guard Regiment in 1848-1914, while Wilhelm II, German Emperor, was even an admiral of the Imperial Russian Navy! CORRECTION: The article previously stated that the uniform Prince Harry wore is that of the Colonel-in-Chief of the Royal Scots Dragoon Guards. 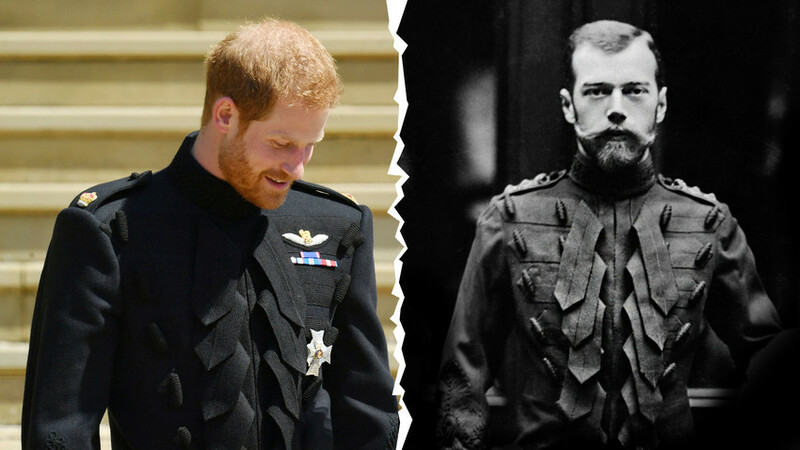 Our readers pointed out that Harry's actual uniform at the wedding is a standart frock coat of the Blues and Royals, which looks almost identical to the Royal Scots Dragoon Guards uniform worn by Nicholas II. The Queen granted Prince Harry permission to wear this particular uniform for the royal wedding. To learn more about Nicholas II's private life, head over here. And if your thirst for knowledge hasn't been satisfied, check out our infographic, where you can learn more about the Romanovs and their non-Tsar lives, as well as view some rare portraits of the Royal family.